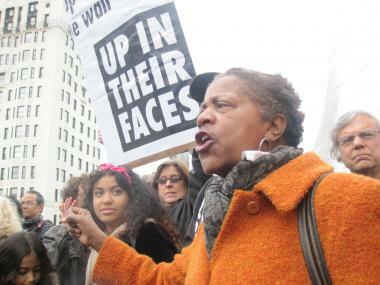 Nellie Bailey, one of the organizers of Occupy Harlem, speaks at a protest against the city's stop and frisk policies in Harlem on Oct. 21, 2011. HARLEM — Occupy Wall Street is coming to Harlem, but don't expect any Zuccotti Park-style encampments. such as the government bailout of the financial system, high unemployment and home foreclosures. "When you look at the conditions in Harlem you see massive unemployment, rising evictions because of gentrification and pressure because of rising rents," said Nellie Bailey, one of the organizers of the Occupy Harlem movement. She said the group will show its support with seminars, marches and rallies. Among the groups involved are the Harlem Tenants Council, Harlem Fightback, and the People's Organization for Progress, NYC Chapter. Cornel West, an activist and professor at Princeton University who was arrested protesting the police department's stop and frisk policies in Harlem last week, is also an endorser. There is a noted lack of diversity among Occupy Wall Street protesters, but there shouldn't be, said Bailey. "We need to address head-on the notion that Occupy Wall Street is a white thing," said Bailey. "I don't think (people of color) comprehend the stranglehold banks have on our institutions." Black and Latino homeowners lost a huge amount of wealth in the foreclosure crisis and many middle class apartment complexes in Harlem are in jeopardy because of banks that allowed owners to over leverage the properties, Bailey said. Federal immigration policy is also an issue. "Our communities are hit hardest from every direction: massive unemployment at a crisis level, the privatization of public schools backed by Wall Street hedge fund financiers, and racist stop-and-frisk policing that has criminalized a new generation of Black and Latino youth," said organizer Larry Adams. Bailey cited the recent problems of Harlem's Carver Bank whose shareholders voted Tuesday to accept $55 million in loans from Wall Street banks and the government to prevent its collapse. Carver is the largest black-owned bank in the country and lends primarily to people in lower-income areas. "Carver deserves more than a pittance and crumbs from the table, but real money to re-establish it as a vital financial institution for people of color," said Bailey. "The crumbs are not enough to satisfy us."